World map showing certification emblems marking location of each of the 11 IOOS Regional Associations. In August 2018, the final U.S. Integrated Ocean Observing System (IOOS®) Regional Associations were certified as Regional Information Coordination Entities (RICE). RICEs are nonfederal observing organizations that meet NOAA standards for organizational and data management practices. The 11 certified organizations demonstrated that they can operate inclusively, transparently, and incorporate stakeholder input to drive system priorities. Once certified, data from these organizations has the full backing of U.S. IOOS and NOAA. To become certified, each organization submits robust documentation of their standards and practices, which are reviewed by a panel of federal NOAA experts. Certification benefits the full system by expanding the pool of available federal-quality observing data to include local assets, and adds new utility to non-federal data sources by providing documentation of practices. RICE certification fosters new partnerships among regional associations, federal, and non-federal groups by recognizing them as a credible entities that produces high-quality data. The inaugural U.S. 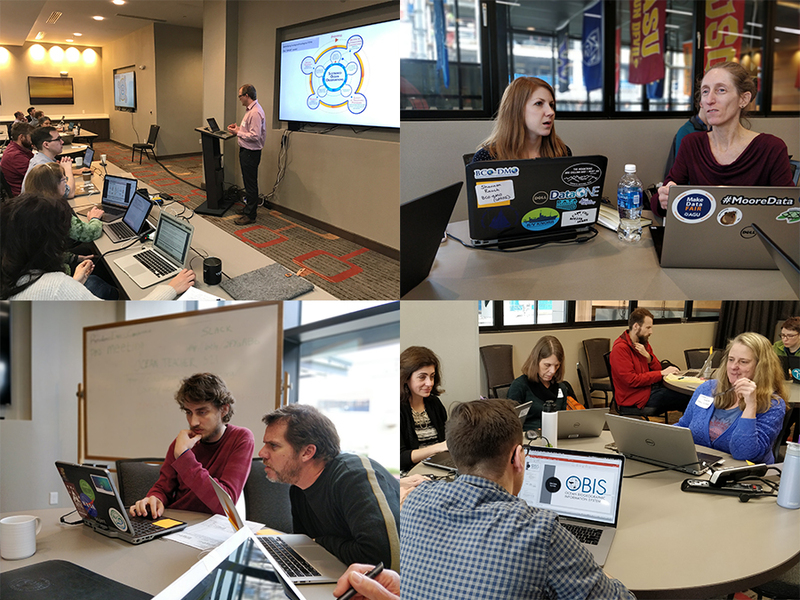 Integrated Ocean Observing System (IOOS®) Biological Data Training Workshop, held February, 2018 in Seattle, Washington, educated participants about the benefits, goals, technology, and processes associated with making biological data more widely accessible in standardized formats. The workshop built on the successful partnership between IOOS and the Ocean Biogeographic Information System to develop a community of practice around the management and analysis of biological ocean observing data. Attendees included IOOS Regional Associations, Marine Biodiversity Observation Network, National Centers for Environmental Information, federal and state government agencies, Smithsonian-led Marine Global Earth Observatory, Ocean Tracking Network, Animal Telemetry Network, Ocean Networks Canada, and Fisheries and Oceans Canada. During the workshop, participants learned about the Ocean Biogeographic Information System (OBIS) from U.S. and international instructors. They also collaborated and discussed the Darwin Core alignment of their individual datasets. In 2017, the National Strategy for a Sustained Network of Coastal Moorings revealed that only 10 percent of federal and nonfederal coastal moorings were capable of basic ecosystem monitoring. In response, the U.S. Integrated Ocean Observing System® and regional partners convened in March, 2018 for the National Coastal Ecosystem Moorings Workshop in Seattle, Washington. Sponsored by the Alliance for Coastal Technologies, the workshop consisted of a diverse community of experts across academia, private industry, and federal agencies. Participants defined use cases and requirements for ecosystem monitoring from moorings and identified current and emerging sensors to meet those requirements. They also identified technical needs, deployment logistics, and data management considerations for integration with complementary observing systems. The participants successfully produced a three-tiered mooring approach that outlines three levels of measuring requirements for ecosystem moorings. This tiered approach will be used by operators as guidance for regional planning. In October 2017, during Group on Earth Observations Week, the Marine Biodiversity Observation Network (MBON) previewed prototype products that were developed to support United Nations Sustainable Development Goal 14, “Life in the Sea.” The products use biological data from the Ocean Biogeographic Information System (OBIS) and sea surface temperature and chlorophyll from MBON seascapes in a dynamic geographic map. The prototypes were built on open source technologies and are intended for use by scientists, policy makers, resource managers, national governments, and others. MBON Explorer currently offers a map of global Exclusive Economic Zones from which a user can extract various measures of biodiversity, including richness and observation counts from OBIS. The MBON team also developed a protection metric derived from the International Union for Conservation’s RedList categories and calculated based on OBIS data for these jurisdictions. Environmental time-series of chlorophyll, temperature, and seascapes generated from satellite products are shown globally, and time series can be extracted for each jurisdiction alongside biodiversity assessments to explore the complex interplay between environmental change and biodiversity. 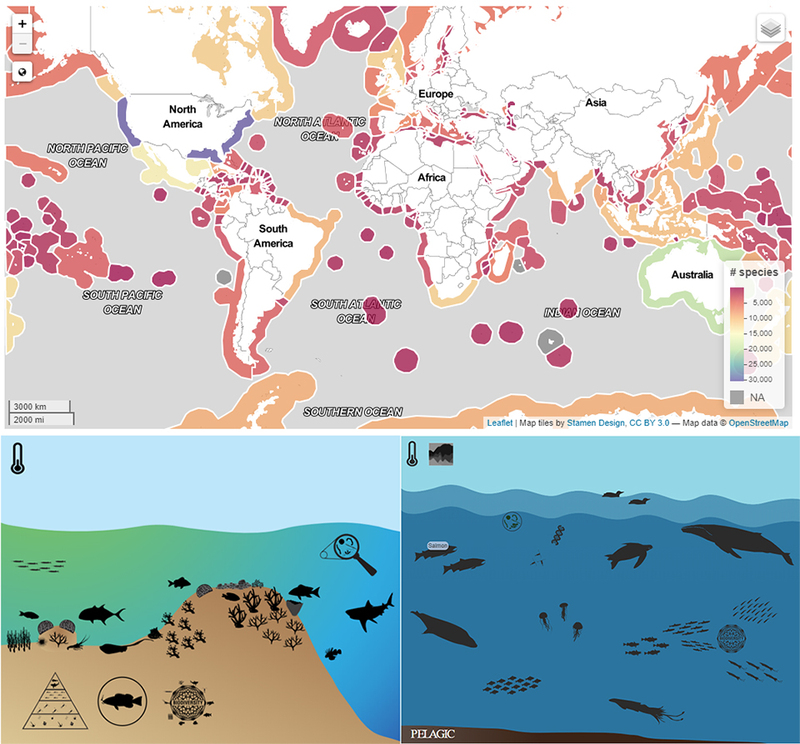 The Marine Biodiversity Observation Network (MBON) Explorer (top) and Infographic Tools (bottom) offer resource managers, researchers, and other interested parties new ways to visualize and extract species data from global biodiversity projects. Cover of U.S. IOOS Enterprise Strategic Plan. The U.S. 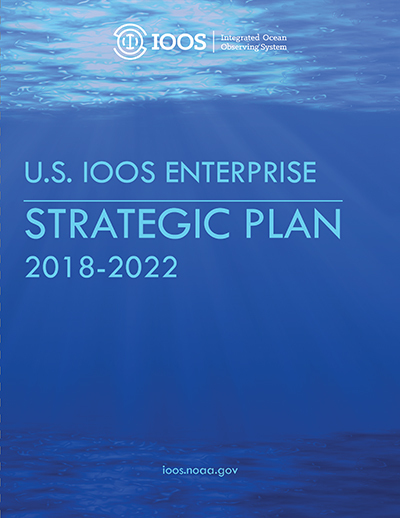 Integrated Ocean Observing System IOOS® released the U.S. IOOS® Enterprise Strategic Plan (2018-2022) in January 2018. This plan sets out an updated vision and mission for the U.S. IOOS, defines the U.S. IOOS Enterprise, and clearly communicates the goals and objectives for strengthening the Enterprise. Developed through extensive engagement with IOOS partners and end-users, the plan includes community input on major components of the Integrated Coastal and Ocean Observing Act of 2009, and details new research and emerging technology related to water quality and biological observing, subsurface observing, and modeling, analysis, and prediction capabilities. In addition, the strategic plan reaffirms IOOS's commitment to NOAA’s core observing efforts and to fostering productive partnerships, particularly with industry and federal partners. 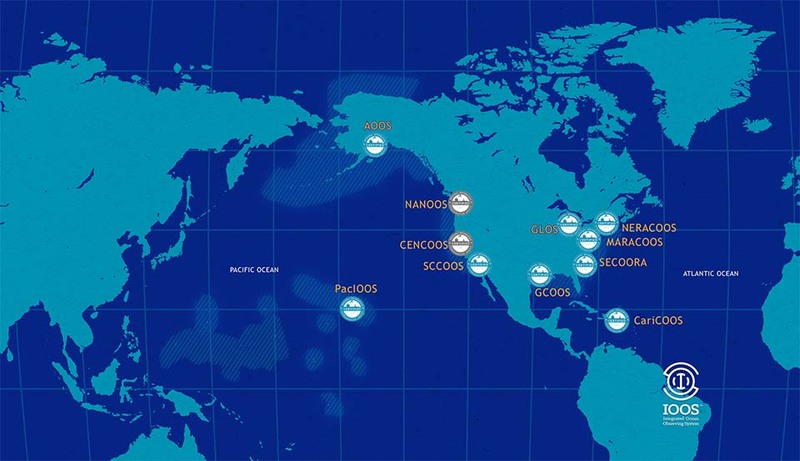 With this new plan, IOOS now has updated goals and strategies that reflect the current vision and mission of the Enterprise as a whole, major advancements in ocean, coastal, and Great Lakes observing trends over the past decade, and explains how U.S. IOOS can secure and improve future ocean observations.